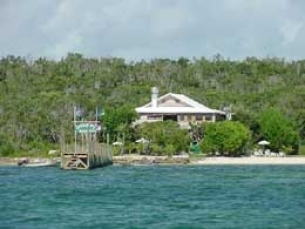 Welcome to Cracker P's owned and operated by Bahamian Chef Patrick Stewart and his wife, Linda. We strive to give you some of the best food, drink and enjoyment in the Bahamas. Cracker P's is situated on the east coast of a 7.5 acre estate/farm. The property goes sea-to-sea (east-west) rising to an elevation of 40ft. in the center (pretty high for the Bahamas). We have beaches on both sides. The western beach may be accessed through our nature trail where you may traverse through a lush forest of native flora and fauna such as Sapodilla, Mahogany, Tamarind, Mangroves, Wild Orchid, Bromeliads, Hibiscus, Bougainvillea to name a few. Lubbers Quarters is a habitat for many species of birds, including Herons, Egrets, White Crown Pigeons, West Indian Red-Bellied Woodpeckers, Banana Quits and Hummingbirds to name a few. One can usually spot a Man O' War flying overhead. When you are finished touring, come on up and have a cold drink (perhaps an icy Kalik or some tropical delight) concocted by our "mixologists". When you're ready to try our homemade cuisine, start with our Smoked Fish Dip or maybe some Grilled Conch. Check out our Catch of the Day. It might be some fresh Tuna or Dolphin (Mahi Mahi) marinated with our very own Hot Sauce and caught by our fisherman, Justin Russell of Local Boy Charters. For lunch we have a wide assortment of burgers and salads. Check out the Daily Special! In the evening, relax and enjoy the splendid atmosphere, especially on moonlit nights. Our dinners consist of fresh fish, chicken, steak and lobster. We have the largest selection of rums in the Bahamas…….and there's nothing like an after dinner cigar. Please call for reservations, as our nights open change with the time of year. Are you bored and don't know what to do? Cracker P's available activities include a cupboard full of board games, volleyball, bocce ball, croquet, horse shoes, badminton and darts, or join the locals in a fierce game of dominoes. For those who prefer to relax, just enjoy the view from a hammock or beach chair and watch the day go by. For a bit of shopping we carry a variety of t-shirts plus colorful original art by our own in house artist, Linda. Cuban cigars are also available at a very reasonable price.